Located between Sydney Airport and the city, Green Square is Australia’s largest urban renewal project. Until recently the recurring likelihood of major flooding during torrential rain hindered the development, but work is well underway to significantly reduce the flooding risk and pave the way for world-class community facilities and infrastructure for the area. At the heart of the development is the $13 billion Green Square project to transform old industrial land into a modern, sustainable hub for more than 61,000 people and 21,000 workers. To address the flooding risk, the City of Sydney and Sydney Water established the DG Alliance with UGL Engineering, Seymour Whyte Constructions, WSP | Parsons Brinckerhoff and RPS Infrastructure Solutions to deliver the Green Square Stormwater Drain Project. The DG Alliance team formed in early 2015 to develop a solution to the flooding problem that was sustainable, innovative and respectful to the community. Delivering a project of this scale in a busy urban environment presents significant technical, logistical and community-related challenges, but the alliance delivery method means the wider team has been involved in evaluating the options and determining infrastructure with the greatest benefit and value to the community. 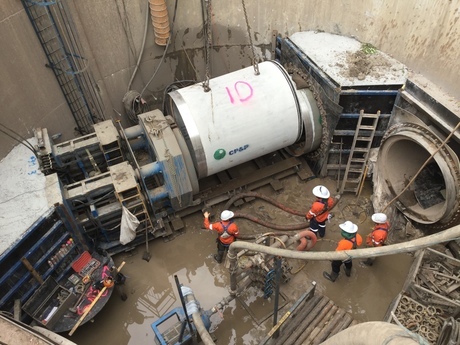 Using a thorough planning process and rigorous modelling, the DG Alliance developed an innovative design and construction solution for a new 2.4 km underground stormwater drain from Link Road, Zetland to the Alexandra Canal. The client’s reference design consisted of box culverts installed by trenching. The alliance design used mainly pipes (twin and triple DN1800 RCPs) installed by a combination of open trenching and microtunnelling. Microtunnelling, which involves using a tunnelling machine to install pipes underground without disturbing the surface, is being used for more than half the drain. Below is a comparison of the impact of microtunnelling versus open trenching. Sustainability benefits are realised through reducing the use of resources, land disturbance, generation of waste, the quantity of material needed for backfilling and groundwater disposal. The alliance maximises the benefits by tracking energy consumption such as petrol, diesel, oil, gas and renewable and non-renewable energy, generation and recycling of spoil, general waste, concrete waste and drilling mud. In particular, the alliance is focused on minimising impacts on people and maximising opportunities to improve the amenity of any public areas that may be disturbed during delivery of the project. This includes restoration and landscaping, and installing a shared pedestrian and cycle path between Maddox Street and Alexandra Canal, providing a community facility along a previously unused corridor. Furthermore, the new stormwater drain will reduce the risk of flooding to enable further residential and commercial redevelopment in Green Square, a place that will combine sustainable infrastructure with community spirit, lifestyle and character. Image caption: Microtunnel pipe installation inside caisson.